Ever since I got the lathe, I have had trouble parting off. This has been due to a combination of things like having relatively wide cutoff tools and the various amounts of wear in the lathe. Having seen various articles on rear toolposts, from the complicated quick change indexing type to the simple Myford casting and having read that they make parting off a breeze, I set about designing and making one for myself. I hope that this page can help someone to build their own. 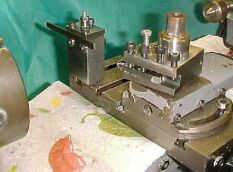 I hope to convey the concept of a rear parting toolpost rather than a precise 'make it this size' article, allowing the reader to adjust sizes to suite the material on hand and the target lathe. Having sawn a chunk off the 60x60mm bar of BMS some time back, and having cut that in 'half' on a friends bandsaw, I set about it with a hacksaw and split the thin section into 2. The hacksawed edge being somewhat rough, and knowing that my lathe faces convex (a common wear problem in ML7's appearently, refer Derek Beck in ME in the early 70's), I first had to make a flycutter. I fly cut the faces of the post block to bring everything flat and square. One of my main concerns was to have a flat base face so that it would sit flat on the cross-slide. I know that if I faced it in the 4 Jaw chuck I would end up with it rocking on the convex base unless I undercut it in the center leaving a 'contact ring' around the edge. This in turn would present a bending force to the cross-slide causing it to stiffen up in use, accelerating wear. My parting blades are 7mm high and currently 2.4mm thick but I will be grinding one down to 1.5mm as that is what I have designed the eccentrics and cap overhang to hold. Adjust the thickness of the eccentrics and the size of the holddown cap to suite your cutoff blades. I found exact center height on my lathe by puttting a sharp ended dead center in the spindle and using it to scribe across the face of the block while sliding the post block on the cross-slide. The cap is held to the top of the post using M5 high tensile cap screws. I purchased a quantity of long ones, which I just shorten to whatever size I desire as no shop in this city stocks them. The holes are drilled to 4.2mm centered just 3.5mm from the edge, so be careful. Also be careful that they do not break through into the 6mm holes. 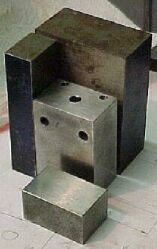 If you have a mill or shaper, you can create a lug on the bottom face of the post that fits the slots in your cross-slide so that it lines itself up when placed. I just line the tool up with the chuck face but an alignment lug would be nice. 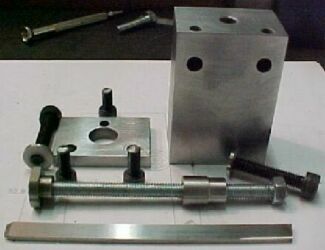 The cap holds the tool onto the eccentrics, yet must be free of the holddown bolt so that the post can be removed without disturbing the tool setting. To this end the cap has a 12mm hole in it. I bored it, but it could just as easily be drilled. Take care with it's position as there is little room for error. The 2 front holes are drilled 5mm to match the tapped holes in the top of the post. The rear hole is tapped M5 to take a cap screw that lifts the rear edge so that the cap can be levelled and thus hold the tool properly. 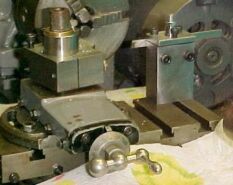 You could mill the cap to provide a correctly sized edge at the rear instead, but it is important that the cap press flat on the top of the parting tool. I cut my cap screws to 12mm of thread for the front 2, and 10mm of thread for the rear one. You will need to adjust the lengths to suite your materials, tapping depth, blade height and so on. The eccentrics are simple enough except that they are thin. I made them from water hardening steel 12mm in diameter. By putting a spacer of about 1.4mm under one jaw when holding the stock in the 3 jaw chuck you get about 1mm offset from center. (There must be a web page on this somewhere out there, when I find it I'll link it here). I didn't worry too much over the exact spacer size as my chuck jaws are well worn anyway and even a precise spacer would not make much difference. I faced, then drilled and tapped M6. 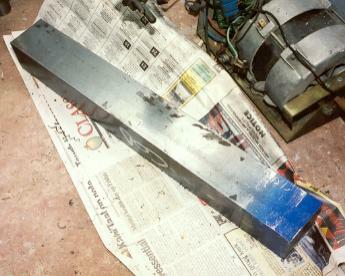 Now the usual Catch 22 caught up with me, I needed to part them off but was busy making the parting tool! I settled on hacksawing one off a bit thick, then facing and hacksawing off the second one, also a bit thick. The holddown needs to extend above the cap plate and the screws in it (particularly the rear one), so I made a spacer from leaded steel (just a handy bar). It is 11mm diameter and 16mm long. Mine shown in the photos differs from the drawing in that I reduced part of it to 10mm to clear the head of the rear screw. The drawing of the cap shows the hole for that screw far enough away to allow an 11mm diameter spacer. This is what happens when you design in the workshop and draw it out afterwards! A view of the general arrangement from the left or chuck side. If you have a sharp imagination you may notice that I have not yet ground the bolts holding the eccentrics flush with the faces of the eccentrics yet (they just catch bright points of light). They are only about 1.5mm too long but removing that bit will let me part off a bit closer to the chuck, always a good thing! A view from the right or 'rear' side. One can place it anywhere along the length of the T slot that is convenient to the operations at hand, I put it on the left as it's easier to align there. Last modified: February 20 2013 07:52:46.